The Object Recognition (OR), Novelty Response or Novelty Scan Test is an important experiment to investigate the effects of drugs or knock outs on novelty response and memory. Therefore we developed this Viewer plug-in that applies OR-algorithms to the locomotion data our tracking software records. Recognition events are described by up to eight parameters with user-defined thresholds. On top, the plug-in provides an object database where all your objects are described and where the relative attractivity of each object can be computed from the data you acquired so far. To differentiate an animal’s real interest in an object from just passing, different parameters are important. Real object interest can be assumed only if an animal is close to an object with its nose. Therefore our software detects the posteroanterior alignment. Additionally we examine whether the object is within the animal\’s visual angle or not. The animal’s locomotion speed and the time the animal spends within the defined maximum distance are further parameters the plug-in considers. To make the data even more significant, you can determine whether or not object recognition events have to go along with sniffing behavior (head stretches). To detect recognition events in the way you want to, you can set thresholds and decide which parameters to use and not to use. Applying changed parameter settings to the same recorded trial repeatedly until the outcome matches your manual scoring is done fast and easily. The system can analyze up to 4 experiments at the same time. Each single result can be saved in a different group result pool automatically. Multiple experiment results can be pooled for a combined analysis. The table in the upper right corner contains one row for each experiment in a data pool. This pool is saved in a group file. 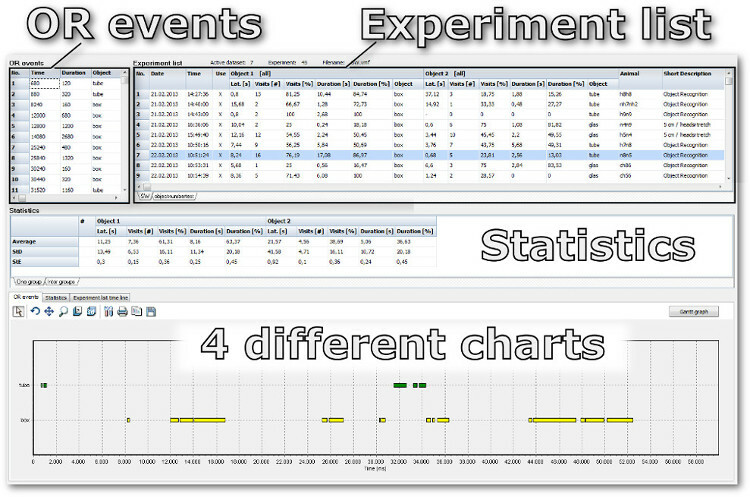 The left table contains all object interest events of the experiment selected in the right table, whereas the table in the middle contains statistics for all experiments listed above.The graphical display area offers diagrams for all parameters in the experiment list tables. Diagrams are always present and automatically updated after each result added. Diagrams are: Ethograms (bubble or Gantt graph), bar charts for all parameters and time lines for all parameters.The bubble time chart provides an impressive overview of all object inspection events. The size of the bubble represents the time all user definable parameters (object within angle of view, animal within max. distance to the object, animal within max. velocity within max. distance, min. time spent within max. distance, sniffing behavior (head stretches)) where redeemed for each inspection event. In addition to single experiment analysis and group statistics, the plug-in offers the possibility to compare group results, too. You can even move single experiments from one group to another in a comfortable way. The figure on the right shows data for three different groups (interest in two objects). All data and graphs can be exported in various formats. The Attraction Factor for each single object describes the attractivity of an object when it is tested with no other competing object. You do pre-test novelty response experiment with each object and the software calculates the factor based on as many animals and trials as you want to. It is also possible to process a factor after your trial with two or more objects. But the amount of visits per time are then influenced by the presence of competeing objects. With this procedure it is possible to normalize all experiments by eliminating the difference in the individual object’s attraction. What do you need for a Novel Object Recognition setup?